This should be enough to get the module installing. Log out and back into the admin area and you should now see it under System – Modules & Updates. We have an empty module. Now we need to make it provide a widget. render_backend(): Determines how the backend customisation settings will look. The easiest way to handle this is to create a model and render it. Details on how to do that below. render_frontend($options = array()): Determines how the widget will look on the frontend. Accepts an optional array of settings that can be used to override the current widget settings. The only other common piece you’ll see in a widget is the optional $settings array. This can be used to provide default settings for your widget. We want to provide a backend UI for customisation options for the administrator. 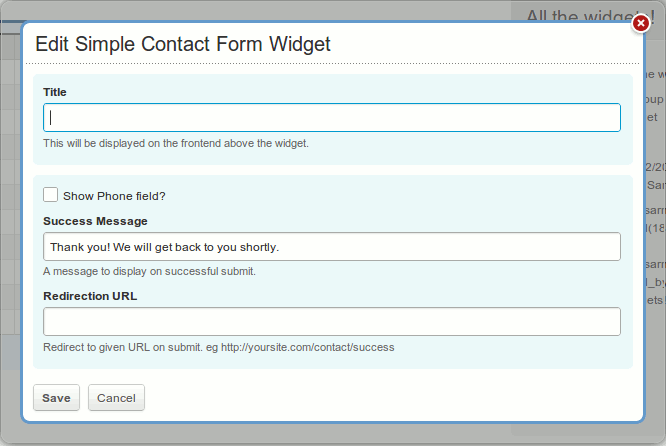 The limited contact module doesn’t provide us many opportunities, but we can decide whether or not to show the phone field, as well as the redirection URL and message. Take a look at the render_backend() method above. Outside of the styling div I’m rendering a model FlynsarmyContactWidget_SimpleContactWidget. You’re able to output any HTML you like here however rendering a model form keeps the look and field of your widget consistent with the rest of LemonStand and provides a bunch of functionality for free. Here’s the code for the FlynsarmyContactWidget_SimpleContactWidget model (/models/flynsarmycontactwidget_simplecontactwidget.php). Notice the default Success message value is present thanks to the $settings array added in the widget class. You should now be able to update the settings at will. Try leaving a blank redirection URL and see the validation at work. How you want the frontend UI to look is completely up to you; I took mine from the contact module page and added a few tweaks. Notice the use of $redirect_url, $success_message and $show_phone variables. Those are the settings made available by the model we created earlier. 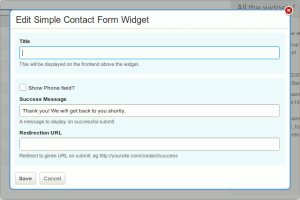 Widgets only consist of two main files – the widget class and a model for rendering the backend settings modal. They can provide alot of functionality and customisability with very little effort and allow developers to rapidly add features to a site. If you write your own widgets I’d highly recommend submitting them to the Lemonstand marketplace – the more widgets available to everyone, the easier all our jobs become!